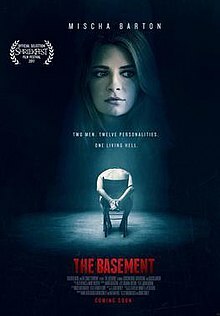 The Basement is a 2017 American horror film directed by Brian M. Conley and Nathan Ives. The film stars Mischa Barton, Jackson Davis, Cayleb Long and Tracie Thoms. The film premiered at Shriekfest in Los Angeles on October 7, 2017. It will receive a 10 market theatrical and digital release in the United States on 15 September 2018. Conley and Ives wrote the script together in the fall of 2015 and they were inspired by films such as Sleuth, Seven and The Silence of the Lambs. Dread Central gave the film 5 stars out of 5, remarking on its "solid script" and praising the "stellar lead performances" of Davis and Long. The website was also complimentary about the film's production values: "DP Kenneth Stipe has done a lot of TV, but here his lighting and composition are truly cinematic. The music is from another hardworking television veteran, Aaron J. Goldstein, whose sounds underscore the tension and few moments of comedy quite nicely. When it comes to the grue and gore – much of it cringe-inducing – kudos go to Julia Hapney and her team."